The Directorate-General for Education, Youth, Sport and Culture of the European Commission has just released the Study on the impact of the internet and social media on youth participation and youth work , that was coauthored by Francisco Lupiáñez-Villanueva, Alexandra Theben, Federica Porcu and myself. 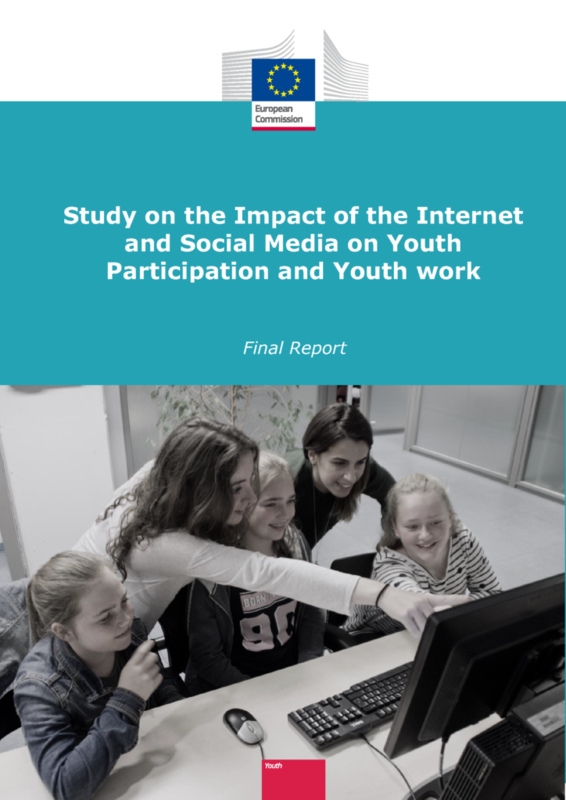 The study analyses 50 good practices and 12 case studies to examine the impact of the internet, social media and new technology on youth participation and look at the role of youth work in supporting young people to develop digital skills and new media literacy . In my opinion, the main result of the study confirms what others have already found and that is increasingly becoming the trend in inclusion and development: top-down approaches only do not work, and bottom-up, grassroots initiatives are necessary for projects to work. In other words, weaving the social tissue has to come first for any kind of community intervention one might want to deploy. Socio-economic status is crucial at the individual level and the knowledge gap has to be addressed immediately before social interventions. Enabling the social tissue at the micro level contribute to strengthen the community and thus improve the diagnosis and mobilise social capital. As people act in different communities, weaving networks at the meso level makes sinergies emerge and synchronise multilayer spaces. Skills and training are key at this level. Once the initiatives have begun to scale up, it is necessary to mainstream and institutionalise them at the macro level, which means fixing them in policies and regulation. Quadruple helix of innovation approaches are most recommended. The acquisition of digital skills has to be based on digital empowerment, on a sense of purpose. Digital participation and engagement has to aim at being able to “change the system”, to structural changes, to digital governance. The now mostly deprecated approach of build it and they will come should leave way to an approach in the line of empower them and find them where they gather . That is, to look for extra-institutional ways that young people participate and engage to design your capacity building and intervention scheme. The study examines the impact of the internet, social media and new technology on youth participation and looks at the role of youth work in supporting young people to develop digital skills and new media literacy. It is based on an extensive collection of data, summarised in an inventory of 50 good practices and 12 case studies reflecting the diversity of youth work from across the EU. It confirms that youth work has an important role to play, but more has to be done by policy makers at both EU and national level to respond to the challenges and adapt policies in order to foster engagement and active citizenship of young people. Lupiáñez-Villanueva, F., Theben, A., Porcu, F. & Peña-López, I. (2018). Study on the impact of the internet and social media on youth participation and youth work. Brussels: European Commission. Lupiáñez-Villanueva, F., Theben, A., Porcu, F. & Peña-López, I. (2018). Study on the impact of the internet and social media on youth participation and youth work. Executive report. Brussels: European Commission. Lupiáñez-Villanueva, F., Theben, A., Porcu, F. & Peña-López, I. (2018). Study on the impact of the internet and social media on youth participation and youth work. Annex 1, Inventory of good practice. Brussels: European Commission. Lupiáñez-Villanueva, F., Theben, A., Porcu, F. & Peña-López, I. (2018). Study on the impact of the internet and social media on youth participation and youth work. Annex 2, Case studies. Brussels: European Commission.